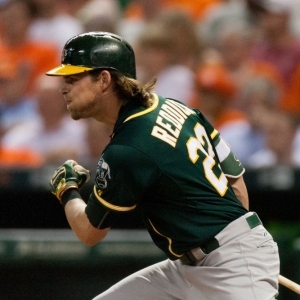 The Minnesota Twins head to O.co Coliseum on Sunday to take on the Oakland Athletics. The Twins send Tommy Milone to the mound to face Jesse Chavez of the Athletics. The opening line for this matchup has Minnesota at +130 and Oakland at -140. The over/under was set at 8. The Twins have a 40-43 over/under record and a 58-32 run line mark, meaning they cover 64% of the time. The Athletics are 44-48 against the run line and have a 47-38 over/under record. They cover the spread 48% of the time. The Twins show up with a 50-40 record, including 19-24 on the road. Starting pitcher Tommy Milone holds a 5-1 record with an earned run average of 2.84 and a WHIP of 1.24. He's pitched 66.2 innings thus far while surrendering 61 hits over that time and when he starts, the Twins are 6-5. Their record against the over/under when he starts is 5-4. The team is averaging 5.4 runs when he starts. The bullpen has given up 259 hits on the season and have a earned run average of 3.69. Opposing teams are hitting .251 against the Twins bullpen while walking 80 times and striking out 181 times. Minnesota is averaging 6.07 strikeouts per game while getting 9.32 hits per nine innings as a team. They rank 12th in baseball in team earned run average at 3.76. Minnesota is batting .254 as a team, which is good for 16th in the league and hitting .227 away from home. The Twins on-base percentage sits at .307, which puts them at 22nd in the league and they have a team slugging percentage of .400. Brian Dozier leads the team in hits with 89 while the team ranks 18th in baseball with 8.47 hits per game. Oakland is 18-27 at home while holding a 41-51 overall record on the season. With an earned run average of 3.40, Jesse Chavez will come into this game holding a 4-9 record and a 1.22 WHIP. He's pitched 100.2 innings thus far while surrendering 97 hits over that time in which the Athletics are 4-11. Their record against the over/under when he starts is 6-8. The team is averaging 3.7 runs when he takes the field. The bullpen has given up 230 hits on the season and have a team earned run average of 4.27. Opposing teams are hitting .237 against the Athletics bullpen while walking 95 times and striking out 250 times. Oakland is averaging 7.61 strikeouts per game while getting 8.01 hits per nine innings as a team. They rank 6th in the league in team earned run average at 3.43. They are batting .255 as a team, which is good for 13th in the league and hitting .265 at home. The Athletics on-base percentage sits at .315, which puts them at 15th in the league and they have a team slugging percentage of .389. Brett Lawrie leads the team in hits with 87 while the team ranks 9th in baseball with 8.78 hits a game. In terms of team defense, the Twins have a fielding percentage of .986 with 48 total errors, 934 assists and 2,396 put outs. The Athletics have committed 84 errors on the season with 913 assists and 2,445 put outs leading to a team fielding percentage of .976 on the year.